2 0 1 9 J A N U A R Y P R I N T W E A R 2 7 accounting to precisely locate their origin. To see if the latest ad or social media boost was worthwhile, you have to track coupon codes or poll customers to attach purchases to promotions. 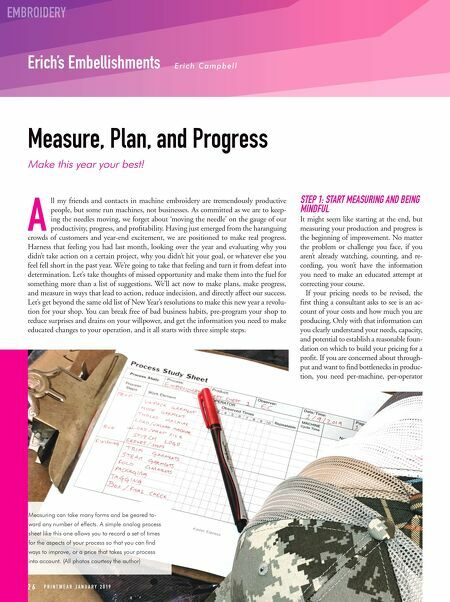 No matter what you want to improve, the basis for clear decision mak- ing starts with measurement for that which can be measured, and the maintenance and mindful attention to those things that can't be neatly counted. If it's important enough to worry about, it's important enough to track. Keep an eye on what comes in, what goes out, and actively cultivate an awareness of the atmosphere of your shop. Establish an attitude of curiosity, a habit of recording, and a regular schedule of check- ing in with every department to gather results. The simplest place to start is in production. Operators should have a mechanism to record and view historical piece-production counts over time periods, jobs completed, spoilage and stoppages in production, and should include notes for nagging and recurring problems. Art and prep staff should be tracking time per job and documenting the most time-intensive work they do and any difficulties in their workflow. If you outsource digitizing, production staff should be aware of the time spent sampling, sending out, and waiting for revisions. ©2018 CIT Group Inc. All rights reserved. CIT and the CIT logo are registered trademarks of CIT Group Inc. Not all applicants will qualify for financing. All finance programs and rates are subject to final approval by CIT, and are subject to change at anytime without notice. Speed and performance are subject to applicant's local connectivity and other factors outside CIT's control. Financing as essential as ink Need financing options? Whether you are buying or selling – we o…er fast financing for a fast world. 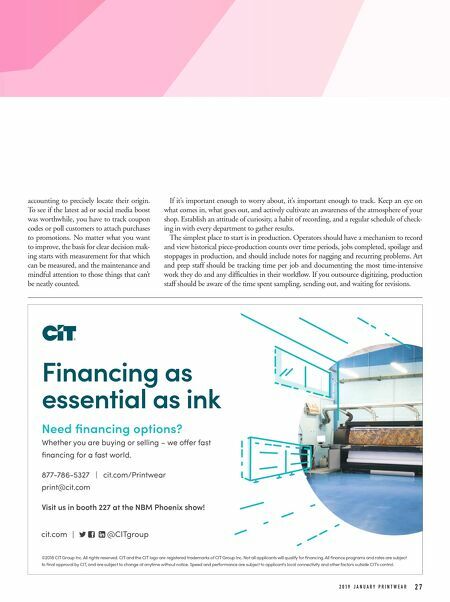 877-786-5327 | cit.com/Printwear print@cit.com Visit us in booth 227 at the NBM Phoenix show!